Every bathroom mirror gives you the opportunity to create a unique look in the room. 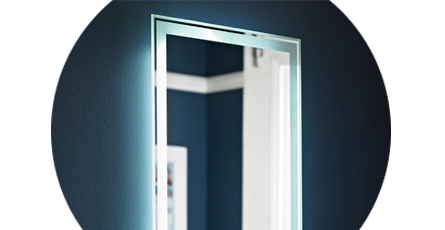 Here you'll find every style of mirror from small cosmetic mirrors to large bathroom mirrors and everything in between. Simply use our filters to choose your style, design or colour and browse our huge range of stunning mirrors available. Large bathroom mirrors are becoming very popular additions and ooze luxury and style. The bigger the mirror, the more the room feels open and spacious which means if you're working with a smaller space then try not to be put off the thought of buying an oversized mirror as it could make your room appear larger than it really is. All bathroom mirrors have different purposes from one to the next. Some bathroom mirrors, such as mirrored bathroom cabinets, are perfect for adding storage whereas illuminated mirrors can help light up a bathroom in a stylish way. Whether adding style or storage we're sure to have your perfect bathroom mirror right here! Good quality mirror. Looks great in the bathroom. The fixing method is bit tricky. Great product but would have preferred the hing on right not left but can't change it.